A warm day, my buddy Cole, and a squirt gun–it just can’t get any better than that. Check out the video of Cal and Cole. 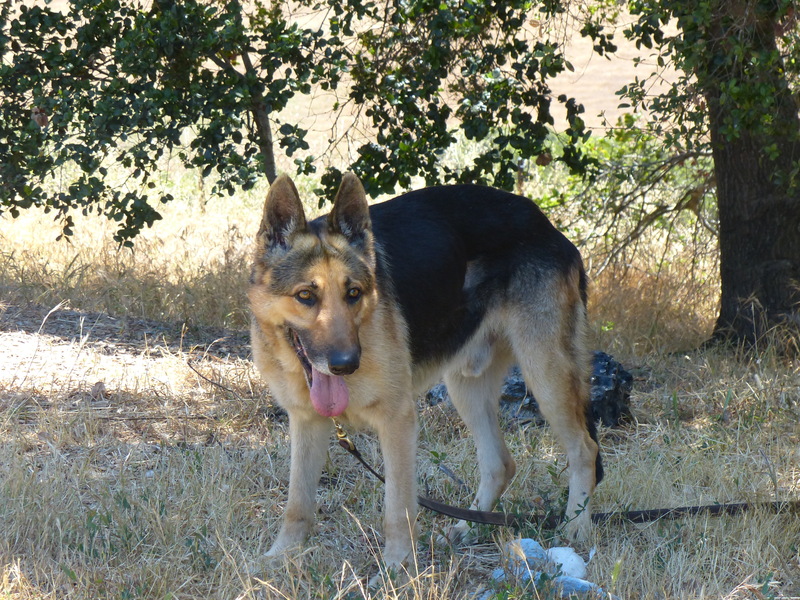 Caleb T. is a senior German Shepherd rescued by the Thulani Program from the Downey Shelter in southern California. The shelter estimated his age at 10 years but we think he probably is a few years younger than that. Caleb is an energetic and active dog who gets very excited about meals, walks, and human interactions. When he first arrived, he was shy yet warmed up quickly. He has done very well with the male and female GSDs at my house, very interested in playing but respectful. During the day, he plays with the two other GSD he has been living with and will then sleep on his dog bed. He is a happy, but excitable dog, although he does calm down after you give him some much desired attention. Caleb wants to be loved and wants attention from people. He enjoys having his neck scratched and will wait by the door for you to give him attention. We have found that he LOVES to bite the water coming out of a hose or out of a water gun. If you allow him, he will chase the water coming out of sprinkler too. He is quite entertaining. At night, Caleb sleeps in a crate without any problems. Caleb is a healthy dog (well he does have ear infections but what GSD doesn’t) with a strong heart and lungs, and no obvious problems with his skin or his digestive system. He eats well and enthusiastically. He will take a dog biscuit from your hand gently and enjoys chewing on a good bone. Caleb will not chew on shoes on or other things left out. But Caleb T. has Degenerative Myelopathy, probably intermediate stage (although he is so ready to run around at full speed that it is difficult to tell how advanced he is.) When he does play with our two GSD’s, he does the bunny hop. When he calms down, he can walk reasonably well yet he is in no way immobile at this point. CALEB IS READY FOR HIS NEW HOME AND LOVE!!! 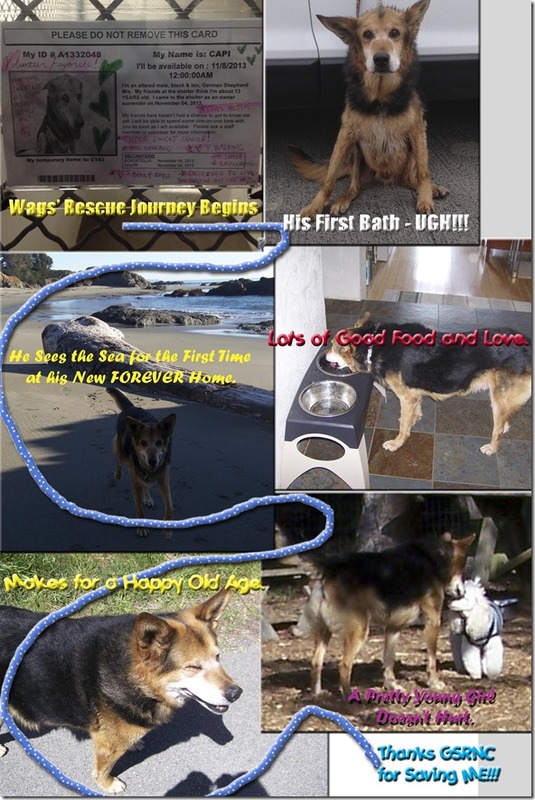 Thulani dog Wags is spending his ‘Golden Years’ on the Sonoma Coast, and his life couldn’t be better. 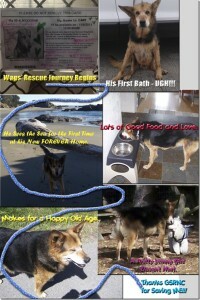 According to his foster mom “He is a real cutie, very sweet and well loved. He has taught all the Patrol Officers to carry treats for him as well as regular walkers who walk on the road near our home. He does his cute little treat dance and they just hand over any treats they have–not so good for his waist-line but very good for his spirit.